On February 8, Aboubacar Dembele went to a Bronx courthouse to resolve an assault charge from an altercation he’d had on a city bus last December. This was his first arrest, and his lawyer says Dembele was acting in self-defense. But things didn’t go as the 27-year-old had expected. Directly after leaving the courthouse, Dembele, who is married to an American citizen, was nabbed by a reported eight to 10 Immigration and Customs Enforcement (ICE) agents, all dressed in street clothes. Dembele’s mother had brought him to the United States from the Ivory Coast, without authorization, when he was just three years-old, and he’s lived in the Bronx ever since. He applied for Deferred Action for Childhood Arrivals (DACA) multiple times but was recently rejected. Dembele also has a green-card application pending through his American-citizen wife. He has been convicted of no crime and knows no other country, but that didn’t stop ICE from arresting him. We’ve been witnessing more arrests like Dembele’s for months now, arrests that illustrate an aggressive new deportation strategy on behalf of ICE. Under today’s regime, long-term residents will no longer have the complexity of the lives they’ve built in the United States considered by ICE. Instead, millions now rightly feel like they are a misdemeanor—or a routine brush with the authorities—away from deportation. Last November, Brooklyn defense lawyers also staged an impromptu demonstration after ICE physically entered the courtroom to arrest Genaro Rojas-Hernandez before his hearing on a misdemeanor domestic abuse charge. 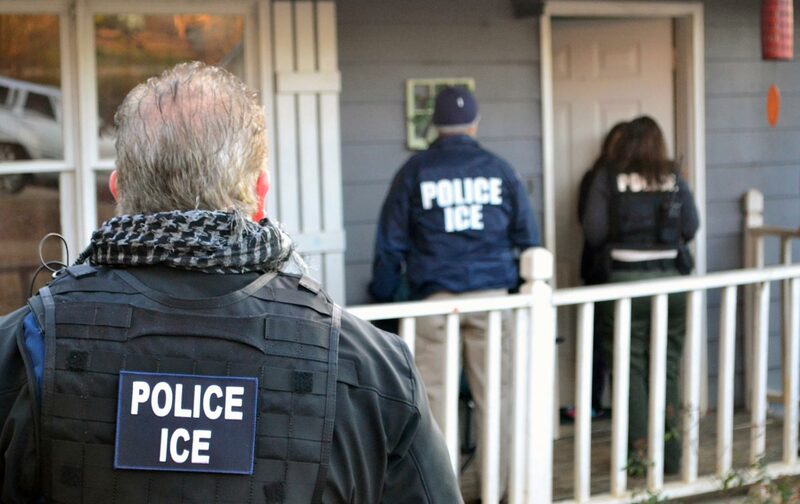 In total, the Immigrant Defense Project found that, compared to 2016, ICE courthouse arrests or attempts at arrest increased by nearly 1100 percent in New York State in 2017. Let’s be clear that our immigration-enforcement system was already cruel before the Trump administration took over. Obama deported millions of people while in office, although the focus of his administration during its second term was on deporting those we usually expect to be priorities in immigration enforcement, people with serious criminal convictions and those who had very recently crossed the border without authorization. But now immigration enforcement is both cruel and unusual. The Trump administration is currently arresting and deporting large numbers of people far from the border, and the consequence of this change is a 43 percent rise in arrests of immigrants in the interior of country compared to Obama’s final months in office, according to a December 2017 Human Rights Watch report. Immigration arrests of people with no criminal convictions, the report notes, have nearly tripled. The people who are now being arrested and deported have often lived here for decades and have fully established themselves in the nation. Many have US-citizen children, spouses, and extended family members. They are frequently well-regarded in their local communities, and many have tried for years to adjust their legal status, a situation that the current immigration system makes extremely difficult if not often nearly impossible. The sudden deportation of Amer Othman Adi to Jordan, a country he hasn’t seen in decades, is a tragic case in point. Adi had lived in the United States for over 39 years, has a US-citizen wife and four US-citizen daughters. He owned and ran several successful businesses in Youngstown, Ohio, and was by all accounts universally admired in his city. Adi has also been trying to get citizenship for himself for decades, but to no avail. His troubles stem from a first marriage years ago that the authorities suspected of being a sham, though his ex-wife signed an affidavit in 2007 denying that charge. Nevertheless, the authorities issued Adi a deportation order which, in his case, didn’t require immediate removal at the time but instead necessitated routine check-ins with ICE, which he did. Adi also had massive amounts of popular support behind him, including a private bill introduced in Congress by Ohio Congressman Tim Ryan asking for a temporary stay of deportation. But during Adi’s last check-in on January 16, the authorities surprised everyone by arresting him. After two weeks in detention, the father of four who has never been convicted of any crime was placed on a plane to Jordan with only the clothes on his back and less than $300 in his pocket. Adi’s case particularly breaks my heart. One of his four daughters, Haneen, was recently my student at Brooklyn College, where she wrote a brilliant master’s thesis on Americanah, Chimamanda Ngozi Adichie’s contemporary novel about immigration to the United States. Over and over, we’ve been told by partisans and pundits that Trump’s incompetence will ultimately save our republic from the president’s authoritarian ambitions. Just last week, Eliot Cohen, a top-ranking State Department official under George W. Bush, told The Huffington Post that Trump’s “too incompetent to be a successful fascist.” And late-night comedy has been reduced to repeating that same joke for over a year now. But the office of the president, regardless of who holds it, is a powerful position, and even incompetent presidents can do great harm—as we see from Trump’s jack-booted immigration policy. For some of us, that portentous future feels like it’s already here. The Muslim ban is currently in effect and is dividing relatives from one another. Immigration arrests of long-term residents are drastically up, mercilessly separating families. Days after the president’s disgraceful “shithole” comment, when he reportedly also said, “Why do we need more Haitians? Take them out,” the administration proceeded to ban Haitians from seasonal worker visas. Whether we are paying attention or not, an extreme immigration policy now rules the land, and it’s a policy aimed at rolling back the now-defining pluralism of our nation. As ever, this policy justifies itself by the slippery concept of “homeland security.” But what bunk those often-misused words contain. After all, what does it mean when your own government promises homeland security to all but then offers it only to some? And what does it mean when that same government seems determined to make the rest of us feel profoundly insecure, even in our very own homes?